Add another benefit to the long list of reasons why commercial customers count on Talley Petroleum Enterprises to get the job done. Our commercial fuel customers take advantage of no-cost supply, delivery, installation, and maintenance of various temporary storage solutions. Storage tanks, fuel pumps, and meter systems are available exclusively to Talley Petroleum commercial fuel delivery customers. Simply become a customer to receive the best fuel delivery service in the region and fuel storage support. We offer varying sizes of Highland stainless steel fuel storage tanks. Current sizes available include 300, 500, and 1000 gallon tanks. 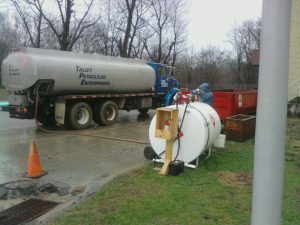 Tanks larger than 1000 gallons are available with additional registration. Industrial fuel pumps and flow meters are essential to promoting a safe, efficient job site. Talley Petroleum is proud to be a certified dealer of GPI meters and PIUSI pumps. To learn more about the models available, simply give our office a call. Does your work often take your team away from your main business location? Temporary storage solutions from Talley Petroleum are available for off-site projects. Fuel storage tanks, fuel pumps, and meters can be used on a temporary basis. If an on-site tank is not an option for your project location, we are able to deliver the fuel you need to fill your most important machinery and equipment. Commercial fuel delivery customers with Talley Petroleum can take advantage of these storage benefits at no charge. Contact us to become a customer or learn more about storage options.